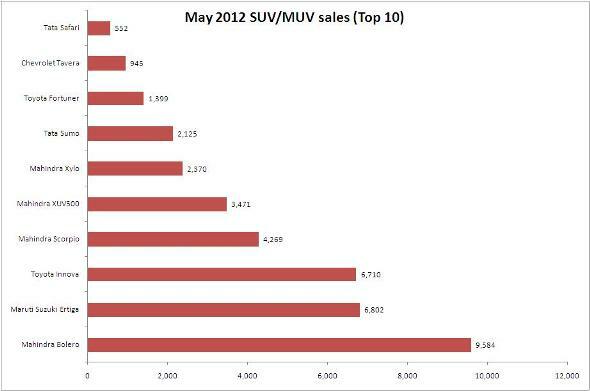 SUV and MUV sales in India, May 2012. Ertiga sales zoom. The sales of utility vehicles in May 2012 largely reflected the market demand for popular models and their dominance over the not-so-popular rivals they compete with. The Mahindra Bolero continues to be India’s largest-selling utility vehicle with a strong demand coming for semi-urban and rural market, but it’s the Ertiga’s performance that’s truly impressive. In May, the Bolero sales stood at 9,584 units which is 16.8% more than its sales in April. The sales average of Bolero is about 9,000 units a month since January 2012. Bolero’s arch rival Tata Sumo had a slight drop in sales as it managed to sell 2,125 units only. The Sumo sold below 3,000 units in the last two months, whereas its sales averaged more than 3,000 units per month during January – March 2012. Photo: Ertiga bags the No.2 spot among utility vehicles in India. In no time, the Maruti Suzuki Ertiga has grabbed the No.2 spot among all SUV and MUV sales in India, surpassing the sales of the Toyota Innova which so far had dominated the MUV segment. 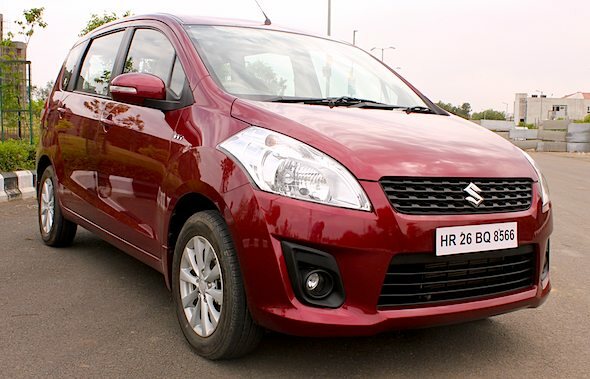 Maruti Suzuki sold 6,802 units of Ertiga In May which is 24% more than its sales in April. It has to be noted that the Ertiga is sold out for nearly six months as the company received more than 32,000 bookings within 30 days of its launch. That said, the Ertiga will likely maintain its 6,000 plus sales in the next couple of months. The Innova though continues to sell unaffected by the Ertiga at 6,600 units every month. In May, the company sold 6,710 units, going to show there is plenty of room for more players in this market. Mahindra XUV500 continues to sell in commendable numbers. In May, the company sold 3,471 units. Its rivals such as the Tata Aria and Skoda Yeti sold below 100 units in the same month clearly revealing XUV500’s dominance in its segment. Given that Mahindra has scaled up the production of XUV500 to 4000 units a month as it plans to open the bookings for this SUV pan India from June 8th, the sales numbers are bound to increase in the coming months. In May, sales of the Scorpio and Xylo were close to their respective sales in April. The Scorpio and Xylo sales clocked 4,269 units and 2,370 units respectively. The Xylo continues to outsell the Tavera. Besides, Tavera has lost some ground as its sales clocked 945 units in May, which is a drastic 51% sales drop as against April 2012. The Scorpio’s arch rival, Tata Safari is also losing traction in the market. In May, Safari sales stood at 552 units, the lowest in 2012. Earlier, it used to sell at about 1,400 units a month. The situation may change once Tata launches the Safari Storme in the coming weeks. Among the premium SUVs, the Toyota Fortuner is the undisputed leader selling 1,399 units, the highest monthly sales in 2012. During January – May 2012, Toyota sold 6,335 units of Fortuner at an average of 1,267 units. Its rivals such as the Ford Endeavour, Chevrolet Captiva and Hyundai Santa Fe average less than 100 units per month. Expect this trend to continue until Ford launches its next generation Endeavour. Summing up, May 2012 was a good month for Bolero, Ertiga, Innova, XU500 and Fortuner. Utility vehicles such as Tata Sumo, Safari, Aria and Chevrolet Tavera had a tough time last month with regard to sales.